(Nanowerk News) Hosted on the reputable MIT campus, the IEEE Body Sensor Networks Conference 2015 brought a diverse group of military and corporate entities along with academic researchers and physicians together in an open colloquium. The 12th annual conference focused on research unique to body sensor networks and allowed participants a unique forum to discuss key issues and innovative solutions for sensors, communications, algorithms, systems and applications of body sensor networks. Among attendees and presenters was ASSIST graduate student James Dieffenderfer who is also a graduate research assistant in Integrated Bionic MicroSystems Laboratory at North Carolina State University. Neoprene wrist strap with ABS plastic shell containing the circuitry for measuring ozone concentration, PPG, motion, temperature, and humidity. This research focuses on the current state of wearables in relation to environmental and physiological sensing. As an exploratory first step, the team aggregated commercially off-the-shelf systems into the ASSIST “Gen-0” testbed platforms to prove effectiveness of the current products on market. 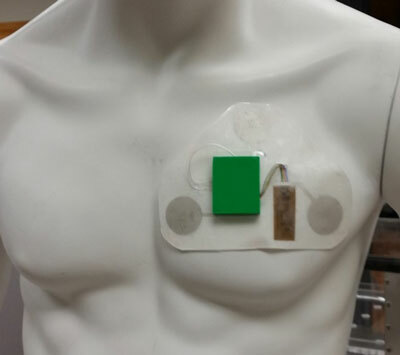 Both the wristband and chest patch constructions overconsumed power, requiring 78mW and 33mW respectively. While fundamentally this research is novel due to the nature of low power correlated sensing between the two parameters on a single platform, this research sheds light to the necessity of ASSIST nano-based ultra-low power electronics and energy harvesting research. Textile patch with ABS plastic shell containing circuitry for measuring ECG, PPG, wheezing, and motion. As the Testbed Leader for the Health and Environmental Tracking, Dr. Alper Bozkurt stated “With a Centerwide goal of 1mW power consumption for each overall platform, in this study we demonstrated that ASSIST’s goal of ultra-low power physiological and environmental sensing is not possible with COTS products. 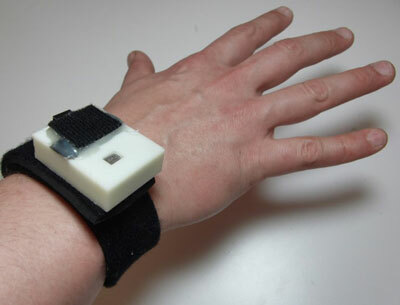 Yet, this chest-patch, wristband and spirometer based wearable platform provides multimodal sensing capability to track the wellness of subjects in terms of exposure related respiratory health”. Drs. Bozkurt, Jur, Peden, their teams and ASSIST as a whole have the goal to produce technologies that are proactive rather than reactive to asthma attacks; this comes in the form of asthma attack prediction in the hopes to prevent overdoses of corticosteroids. Researchers are pushing forward into the nano-engineering realm in order to produce the highly functional, accurate, low-power chest and wrist platforms to fulfil these goals. The NSF Nanosystems Engineering Research Center (NERC) for Advanced Self-Powered Systems of Integrated Sensors and Technologies (ASSIST) develops and employs nano-enabled energy harvesting, energy storage, nanodevices, and sensors to create innovative, battery-free and body-powered wearable health monitoring systems. This center of excellence received funding from the National Science Foundation (NSF) in 2012 for five years of research, renewable out until 2022.